Will and Lyra, whose fates are bound together by powers beyond their own worlds, have been violently separated. But they must find each other, for ahead of them lies the greatest war that has ever been – and a journey to a dark place from which no one has ever returned. How will Lyra and Will survive the terrible sacrifices and challenges placed before them? And as conflict explodes between the worlds and Heaven, what is the knowledge they must seek to bring their long quest to a close? The soul-shaking finale to Philip Pullman’s masterful His Dark Materials trilogy. I would love to read this book as I have read the first one (The Northern Lights) and I was spellbound. Hopefully this one is as good! Philip Pullman is probably the world’s most acclaimed living children’s author, best known for the trilogy of books known as His Dark Materials. Philip won the Nestle Smarties award for both Clockwork and The Firework Maker’s Daughter. Northern Lights was published in hardback in July 1995. That year, it won the Carnegie Medal and Guardian Children’s Fiction Prize and was Children’s Book of the Year at the British Book Awards. 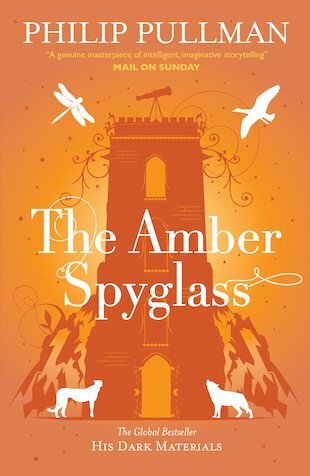 The Amber Spyglass won WHSmith Children’s Book of the Year 2000 at the British Book Awards, was Highly Commended for the Carnegie Medal and was longlisted for The Booker Prize 2001. Philip Pullman was voted Whitaker Author of the Year by the Booksellers Association. The Amber Spyglass went on to win both Whitbread Children’s Book of the Year and Whitbread Book of the Year 2001 and in doing so became the first children’s book to win the main prize in the award’s history. Philip has also been recognised with two major awards for his contribution to literature: the Eleanor Farjeon award in 2002, and the Astrid Lindgren Memorial Prize in 2005.